Travel with a small group of friends or family on a dream journey by private jet, backed by the finest luxury travel company in the world. Luxury travel leader Abercrombie & Kent is partnering with private aviation experts Flexjet to provide the ultimate private jet travel experience. 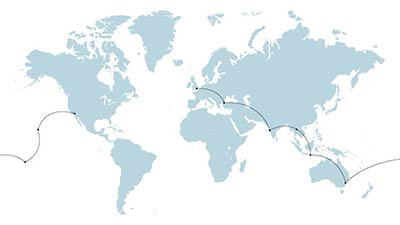 Passport to the World takes your small party of up to eight guests on an unforgettable voyage to some of the globe’s most alluring destinations, with A&K’s incomparable network of local offices revealing each stop on your journey at its most authentic. From an enchanting kaiseki banquet in Kyoto to a private visit to Istanbul’s Topkapi Palace, experience the world through an unrivalled combination of luxury, attentive service and insider–access moments that make every visit an inspiring encounter. And because each Passport to the World itinerary is customized for you, you choose when you want to travel. Together, we invite you to experience the world as only a privileged few can: in the utmost privacy and luxury, with the best local experts at your side. Experience the glamour and ease of around-the-world travel by private jet, enhanced with the ultimate luxury of staying only in Four Seasons hotels & resorts. Enjoy high-quality excursions, exceptional dining and a support team of travel experts. In this partnership with private jet tour operator TCS & Starquest Expeditions, you'll fly on a VIP-configured private jet with a small group of like-minded travelers. Unforgettable adventures promise complete peace of mind and the highest standard in comfort, security, and Four Seasons care. From the Maldives to Serengeti, nine destinations will astound and delight you. Staying in only Four Seasons hotels and resorts and traveling with like-minded companions, you'll find yourself creating memories and stories you'll reminisce about over and over again. Let the people, places and rich traditions unique to these nine destinations—from fire dancers in Bora Bora to architectural wonders in India and Australia—guide you along this transcendent, 24-day journey. Immerse yourself in the art, music, culture and history of Europe’s most celebrated cities, enjoying exclusive performances, behind-the-scenes tours of landmark attractions and museums, and sensational dining throughout the 16-day journey. Enjoy an array of epic experiences on this 24-day global expedition. Go on safari through the Serengeti, dive with a marine biologist in the Maldives and learn to make sushi in Tokyo. COMING SOON!!! Contact us for more details!